Just had to say that I plan to be in the water for most of the day, and hopefully I'll be able to check out most of my favorite spots in Ventura Co. (Fairgrounds, Santa Clara Rivermouth, Silver Strand, County Line, Zero). It should be epic just to read how everyone's sessions went. I stumbled upon Fang on New Year's Eve, 1995, when walking down to check the cove at Rincón. It was pretty windy and she seemed pretty surfed-out from riding big San Onofre a few days before. I was hoping to meet Will Borgeson on one of his annual trips down this way at that time, but we didn't meet. A year later we hooked up and got classic cove waves, fairly uncrowded, on New Year's Day, 1997. That was a day or so after Bettye and I got back from our honeymoon in Hawaii. On Hawaii I met up on the South Shore in mid-2003 with Neal Miyake, Bud, and Mama Sus. Neal paddled me out before sunrise to a south shore reef break with waves around head high, and Bud showed up later out in the water to surf with us. After I cut my finger on the reef and went in to shore, Mama Sus showed up and took me on a whirlwind tour of the south shore spots. Surfed with Neal Miyake, Bud and Rich Williams; met Sus. See Neal's story here. In winter of 1996 during my honeymoon with Bettye I met up on the North Shore with Scott Thomas, one of the originators of the alt.surfing surf report, who dragged me into a windy Pupukea / Gas Chambers lineup for 3'-5' Haw'n waves. Scott doesn't post much anymore and is now living and surfing in Hawaii, but I still see him about once a year at Rincón when he comes into town. Additionally at Rincón, Steve Lange, NeoN, and I had a good 2-hour long off-season session on longboards in almost vanishingly small, knee-high but perfectly shaped cove waves. Later that year, Steve and I happened to meet Wardog in the water north of Point Conception, as well as meeting Keith "MiffMole" Elliott at a small local alt.surfing get together held again in small waves at Rincón. Keith and I later met up with SurferBob and Foondoggy in Ventura for a great story session at Duke's on Seaward. Unfortunately the surf was flat, but I did get to try a Krispy Kreme. SurferBob and I have surfed together many times after reading each others' posts here for about 6 months, including an extended Baja trip. The first time we met and surfed together was in June of 1996, coincidentally at the very same stretch of beach break where L.A. local Jose Borrero and I met and surfed together for the first time. Jose's report about that session was what prompted Ric Harwood's question that led me to create these pages. Other L.A. area alt.surfers I met include: Gamivia Duke, shortly before his disappearance, at Malibu, we recognized one another immediately being the only people there; Tony Austin, with whom I have by chance surfed a couple of sessions at Leo Carrillo, again recognition was easy this time due to Tony's Fang-inspired crash-test-dummy-airbrushed board. Ric Harwood and I met and surf-tripped together in Santa Cruz. Other alt.surfers Gioni and John Airey were there for that session. 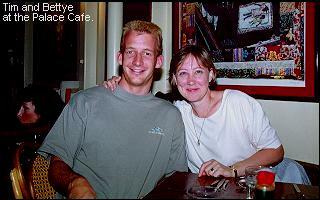 John and I later went on a Baja trip in the winter of 1998. In fact, my first trip included a session at Blacks with one-time poster Greg, the Blue Guy. Back in Santa Cruz, Da Hulk and I met on the beach after the aforementioned session with Ric, Gioni, and John, and surfed together briefly later that day at Pleasure Point. Other Bay area alt.surfers that I've surfed with include: Leo Dagum, both in Santa Cruz and in Santa Barbara, and Eric Valor, in Santa Cruz at 4-Mile, the same day I first surfed with Leo. Glenda Carroll and I met briefly at C Street, but didn't surf together, and on a later visit of Glenda's we failed to recognize each other at all! John Singer and I later did manage to recognize and surf with each other at that spot and Rincón. In the winter of 2001 I finally paddled out for a memorable session at Ocean Beach after several trips up north during which I met alt.surfers but didn't surf. Dave Blake, Lloyd Pollock, Jeff Kaplan, and Gioni gave me an excellent introduction to the place, including loaning me a 7'7" to ride, from-the-beach guides to the currents and rips, and regular phone updates on the conditions. See some pics from the session. someone in a surf report on the newsgroup. He posted the occasional report from Sands. Alley OOP of the Ryncon Ryders and I have met and surfed together several times at Rincón. AFAIK he's the only Ryder who is an alt.surfer. I've even participated in one of their night-time summer surf sessions in the Cove but never done the Watusi initiation nite into the Ryders clan. California coast traveler and current Ventura local Mike Beck (of Pacific Waverider) and I have also met, but not surfed together. I attended one of the alt.surfing "Paloozas" down at San Onofre, and while I didn't surf with anyone I had a blast meeting and talking story with: Tom Keener, Dan "Crag T. Bagger" King, Craig Kemnitz, Terry aka "sdbchguy", the inimitable BK, as well as countless other members of the SanO crew who may or may not have posted to alt.surfing at one time or another. 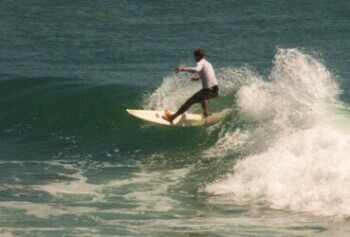 John Hermesman and I surfed together a year or two later (July 2001) at Upper Trestles/Cottons. We waited for a long time on the beach for Rod Rodgers to show up, which he did, on the trail, but he and I didn't get a chance to surf. San Diego - Oct/Nov 2003. During a 20-day visit to San Diego for a field experiment (see http://science.whoi.edu/users/elgar/NCEX/ncex.html), I managed to get a little time to meet Tom Keener, Joanne VanMeter, and Bill Andrews for food. Also during the trip I got to deal with ash, fire, kelp, sewage, way too many naked people, and a little bit of bodysurfing in between some of our instrument frames.